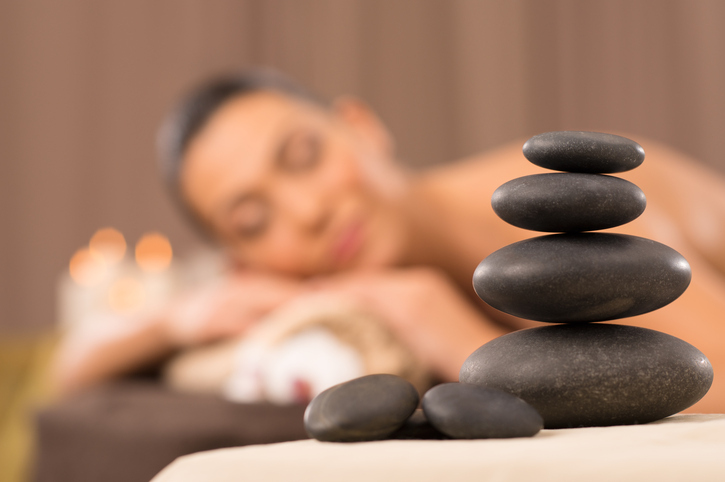 Hot stone massage bears many similarities to Swedish massage, which is one of the most popular types of bodywork. For this technique, massage therapists put warmed stones on their clients’ bodies to relax muscles and soft tissues before (or after) a massage. You can enjoy the relaxing feel of the warm stones and may experience a variety of physical and emotional benefits. If your muscles are especially tight and painful, this extra treatment can make a positive difference in your massage therapy results. For over two millennia, Chinese practitioners have used heated stones to improve organ function. Ancient cultures on many continents have used stones for healing. Female caregivers in Spain used hot and cold stones to soothe menstruation pain, aid in labor, and reduce post-birth bleeding. Classical Greek and Roman practitioners used heat, cold, and stones for healing, which led to today’s modern practice of hydrotherapy. When hot stone therapy was reintroduced to the mainstream public near the end of the 20th century, it rapidly gained popularity as a relaxing, effective, and luxurious treatment. Many craniosacral, reiki, and polarity therapists now use heated stones in conjunction with their treatments. Hot stone massage therapists typically use smooth river stones made of basalt. Because basalt contains a large amount of iron, these stones can stay warm throughout the entire treatment. Some practitioners use basalt from lava flows. These stones contain magnesium and calcium (in addition to iron), which may provide extra healing. Hot stone massage makes an excellent complement to other popular types of massage. Enjoying this therapy in conjunction with a Swedish or deep tissue massage loosens up your muscles, helps you relax, and allows your massage therapist to work on your deepest tissues. Unlike a typical massage, in which your practitioner may only treat your surface issues, hot stone massage puts your body in a deep state of relaxation that may aid in healing, pain relief, and provide therapeutic benefits. Swedish massage, a close relative of hot stone massage, is an oil-based style of massage therapy that involves long, smooth strokes, kneading, tapping, and percussive techniques. Practitioners often use friction (rubbing) techniques to loosen up trigger points and scar tissue. This type of massage opens up surface level tissues and increases circulation. Another similar practice, deep-tissue massage, involves the connective tissues that hold your body together and support and surround your muscles, tendons, and organs. By softening and lengthening these tissues, your muscles have more room to move, allowing you greater flexibility, performance, and respiration. Deep tissue massage therapists also work on the adhesions that stick muscle fibers together after injury or overexertion. When hot stones contact the body, they trigger hyperemia (increased circulation near each stone). If you suffer from arthritis, the heat of the massage stones can provide great relaxation, mobility, and pain relief. However, hot stone massage isn’t right for all arthritis patients—be sure to ask your physician before trying out this therapy. Hot stone massage isn’t recommended for pregnant women or people with certain skin conditions. People with heart conditions, diabetes, and high blood pressure should avoid hot stone massage. Also, patients who suffer from deep-vein thrombosis (blood clots) should avoid this and all other types of massage. If you think hot stone massage might be helpful for you, ask your doctor before scheduling your first appointment. Before your session, your practitioner will heat up the stones in a sanitary solution to avoid transmitting infection. They will know how much to cool down the stones so you can enjoy a stimulating (but not excruciating) experience. Be sure to speak up immediately if the stones are too hot for you or if they’re putting too much pressure on a sensitive part of your body. Your hot stone massage therapist may place hot stones on your back and hands and even between your toes. Many people enjoy hot stone therapy along their spine or in the palms of their hands. Just as in Swedish massage, hot stone massage practitioners often use oils to lubricate your body, prevent scraping, and facilitate deep tissue bodywork. Your massage therapist may stroke your muscles (using oil) lengthwise with large, flat stones. They may also place the stones on energy trigger points, in a similar method to acupressure therapy. As the stones cool off, your hot stone massage therapist may replace them with heated ones to continue loosening your muscles and deepening your massage. A typical hot stone massage session lasts about an hour. Be sure to hydrate your body afterward and get plenty of rest. Mayrhofer, P. (2010) The History of Hot Stone Massage. Massage magazine.